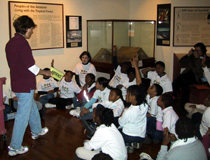 (2 field trips with two fourth grade classrooms in April of ’02) - The children started their day at the museum in a Discovery Class called the “Magnificent Maya.” The program blended activity-oriented, inquiry-based learning with a hands-on approach to help the children develop a better understanding of the ancient Maya civilization. The children were educated and entertained by one of Harvard University’s elite teachers. They learned about the Mayan’s rich, 1,000-year-old history and culture. The children became real life historians and got to ask questions about the Mayan past. They were able to see and touch tools, carvings, and artifacts, expanding their learning experience even more. After visiting the Discovery Class, the children were able to walk around and explore different exhibits in the museum.